For the past 75 years, electron microscopy of biological tissues has generally involved either scanning electron microscopy (SEM) of the exterior surface of the animal, or transmission electron microscopy (TEM) of thin sections through the middle of the animal. Preparation of serial thin sections of the nematode has been a cherished art that only a few skilled technologists have mastered. These thin sections have been collected onto fragile TEM grids where they lay on a delicate transparent film. If one grid bends or the film breaks, the continuity of the series is lost, and the attempt to reconstruct a volume of tissue is aborted. The ATUM (Automatic Tape-collecting Ultra-Microtome) is currently the most advanced means to automate the collection of serial thin sections onto a more stable, continuous reel of tape, which can then be stained and viewed by SEM rather than TEM (EMATUMFIG 1). The level of detail that can be detected in a thin section by a modern SEM now begins to rival the quality of thin sections viewed in a standard TEM. The automation of this process may broaden the availability of serial sections to a wider audience, and also speed the analysis of 3D volumes. Work by Jeff Lichtman and colleagues at Harvard has produced several versions of the ATUM microtome, which is designed to automate the collection of serial thin sections based upon a novel microtome configuration (Hayworth and Lichtman; Kasthuri and Lichtman, 2010). 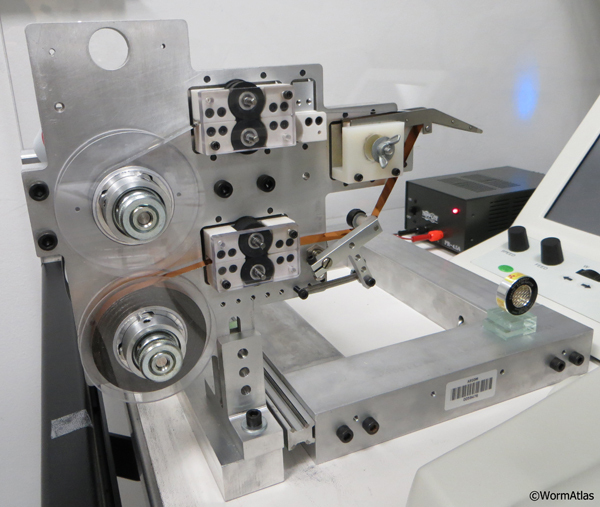 A sturdy, continuous transparent tape mechanism feeds past the diamond knife, so that thin sections of the plastic-embedded sample are immediately transferred onto the tape (EMATUMFIG 2 & 3). The tape moves onto a collecting reel, after which the sections can be exposed to conventional poststains and rinsed, while still mounted on the tape. Afterward, the tape is carbon coated to protect the sections and cut into shorter segments to be stored on a set of silicon discs (EMATUMFIG 6). Discs containing stained thin sections can be brought into an SEM for imaging as needed, or stored for imaging at a later time. The microtome cuts the tissue on a diamond knife and the section thickness can be set to the desired thickness, down to 30 nm. The machine can operate unattended and will collect 1000 serial thin sections per day. The first generation machine was called the ATLUM (Automatic Tape-Collecting Lathe Ultramicrotome). However, this unit was large and was very expensive to produce (the original unit cost around $200,000 to produce). 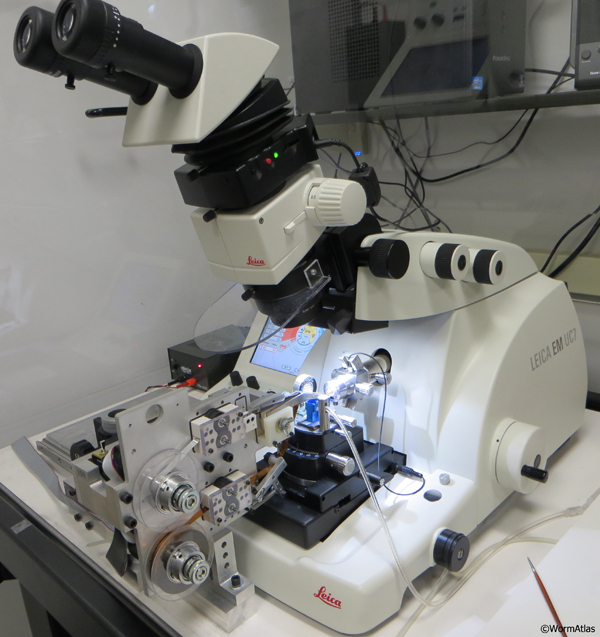 A smaller, affordable version of the machine (now called ATUM) is now available that can be connected to commercial ultramicrotomes (such as the Leica Ultracut microtome; see EMATUMFIG 2) to collect sections onto tape in a similar fashion (Ken Hayworth, pers. comm.) making it a much more practical tool for laboratories to use (Schalek et al., 2011). Data is starting to be generated using this technique (Tapia et al., 2012) and this device is now installed at a growing number of academic labs in the US, including at Harvard, MIT, Columbia and Einstein. The ATUM collecting device is mounted on a secure railing attached to the microtome bench so that the ATUM can be swung into position against the ultramicrotome, or moved away from the microtome when not in use. A camera is mounted to view the knife and the boat of the diamond knife, so that the exact water level can be monitored and adjusted by computer (EMATUMFIG 4). Whenever the water level drops, the change in level is detected and water added dropwise to the boat from a syringe controlled by the computer (EMATUMFIG 5). Two large reels hold the collecting tape before and after section pickup. The tape runs through an automated tensioning mechanism, not unlike that on a motion picture projector, to assure that the tape feeds evenly through the device while in use. The tape runs through a pickup roller that can be dropped into the boat just behind the diamond knife edge. As each thin section is cut, it pushes the previous thin section onto the tape for pickup and drying. In this manner, sections proceed onto the tape one at a time without overlap, and as the sectioning proceeds, the tape advances slowly from supply reel to pickup station to storage reel. When all sections have been collected, the tape is cut into multiple short strips and glued onto a 4 inch circular silicon disc (EMATUMFIG 6). These tape segments can be exposed to post-stains, such as UAc or Pb Citrate, in much the same manner as we normally treat thin sections to improve contrast before viewing. 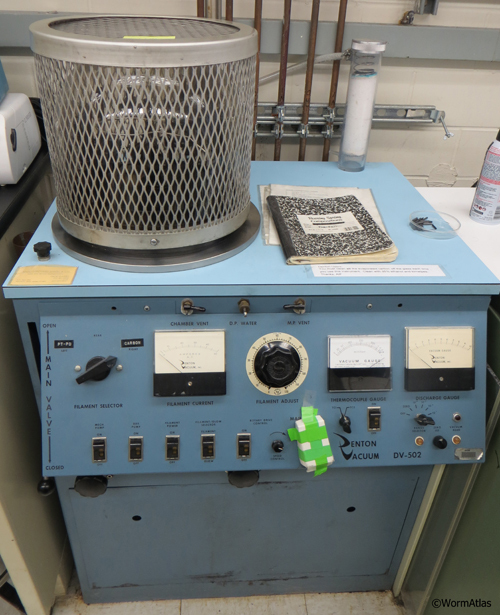 The tape is then placed into a Denton evaporator (EMATUMFIG 7) for carbon coating to help protect the sections from damage before microscopy. These silicon discs containing the sections are then stored in a clean dry place. Conditions for viewing these sections by SEM are not unlike those for block-face imaging techniques, such as the 3View “Denkotome” or FIB/SEM devices (EMATUMFIG 8). One generally expects to use backscattered electrons to probe the top 30-50 nm of the thin section when collecting images. Special fixations of the nematode tissue are recommended to enhance the amount of heavy metal inside each section. 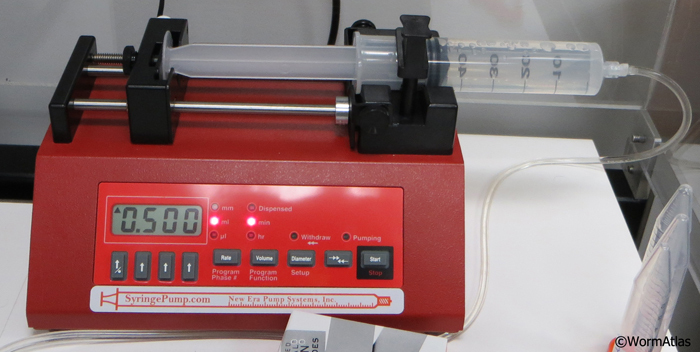 EMATUMFIG 1: ATUM (Automated Tape collection device for the UltraMicrotome. Bottom spool holds a store of coated tape onto which thin sections will be collected; top spool will collected the used tape. Servo devices control the tension on the tape, much as in a film projector in order for the tape to be smoothly delivered to the section pickup zone, which is pointing away from this image, on the right. EMATUMFIG 2: ATUM mounted onto side of a Leica Ultracut ultramicrotome. EMATUMFIG 3: Detailed view of ATUM device positioned by ultramicrotome. 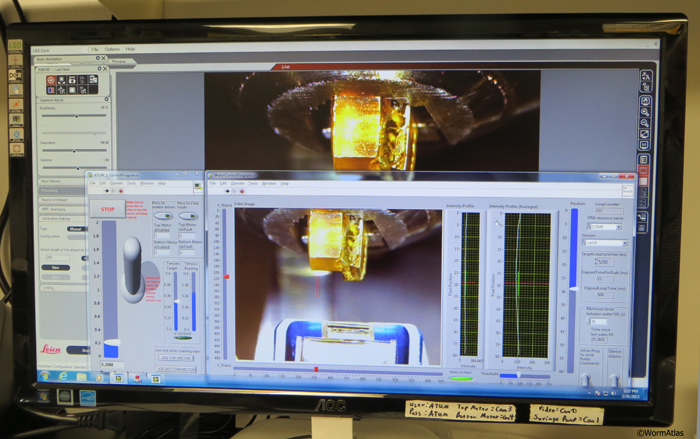 Close up of the ATUM device positioned by the Leica Ultracut ultramicrotome. 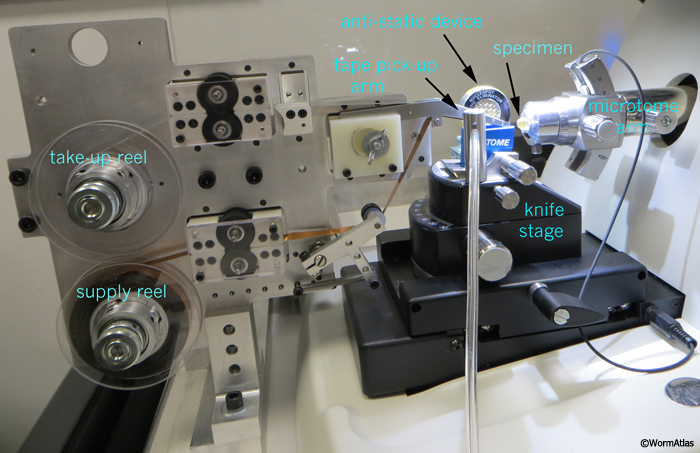 Here the tape pickup is positioned at the top of the Diatome diamond knife’s blue “boat”, directly opposing the arm of the microtome, which holds the plastic block to be thin sectioned. EMATUMFIG 4: Live camera view of sectioning. Computer monitor shows a live camera image of the plastic specimen block (yellow) as it nears the edge of the diamond knife, which is held at the front of the Diatome boat (blue). A scale on the right side shows the current water level inside the boat. A computer interprets this image to decide how much water must be added from a motorized syringe to keep the surface level within the desired range for automated thin sectioning. EMATUMFIG 6: Serial thin sections on tape. 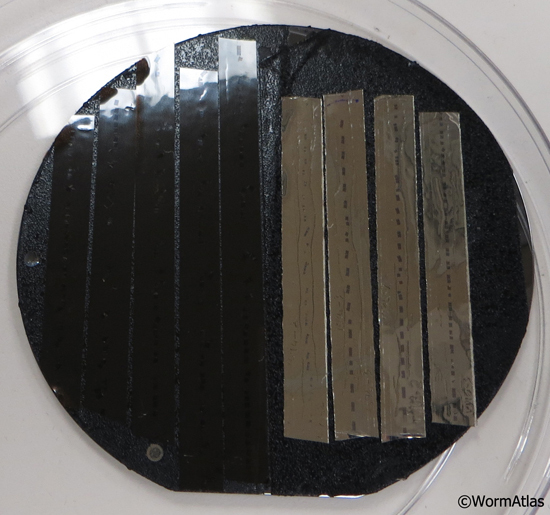 Portions of tape with serial thin sections are glued onto a 4 inch silicon wafer for holding them inside the chamber of the SEM. Two types of tape are shown here: on the right is plastic “Kapton” tape, on the right is aluminum tape. Here the silicon wafer is stored inside a plastic culture dish when not being used inside the microscope. EMATUMFIG 7: Denton carbon evaporator. This machine is commonly used for carbon-coating Formvar or Pioloform grids prior to section pickup (see Gridmaking methods section), or for coating Kapton tape after ATUM sectioning. The added carbon layer serves to strengthen Formvar or Pioloform films, and can also shield thin sections on Kapton tape from later contamination. EMATUMFIG 8: Zeiss Supra 40 SEM. Zeiss Supra 40 scanning electron microscope can be used either in STEM mode to view thin sections on grids, or in SEM mode using backscattered electrons (or with secondary electrons) to view thin sections collected with the ATUM device onto tape. Expected resolution in SEM mode is not quite equal to that achieved by TEM or STEM, but should be sufficient for many purposes. Imaging can be automated by computer control of the stage controls and camera. Digital cameras now offer much better detail than older SEMs that used Polaroid film. Hayworth, K.J. and Lichtman, J.W. ATLUM Project. See http://cbs.fas.harvard.edu/science/connectome-project/atlum.